Page one is an activity on how to make a storyboard clearer and more dramatic. Your boss asks for your critical analysis of this storyboard drawing. What do you notice? Use professional vocabulary terms to answer. Use any medium to mark up the drawing to increase its clarity and make it more dramatic. What did you change to make the story clearer? What did you change to make the story more dramatic? If you’ve studied or done animation for any length of time you’ve no doubt come across some absolutely fantastic storyboards out there. Single images that tell the story at hand with elegant brilliance yet wonderful simplicity. To create such pre-production masterpieces it takes a lot of skill and a huge amount of hard work and practice, of course, but there IS something you can do right now to make sure your storyboards really pop visually. The secret? Add simple tone. Hardly a secret at all, really, as contrast is the number one aspect to keep in mind when creating something. Big to small, hard to soft, fast to slow. When you add in contrast, things become much more interesting. Contrast is useful in all aspects of your work, but when it comes to storyboarding it shines brighter than ever. Storyboarding is all about telling a story with one image and leading the viewer’s eye to exactly what’s important. It is normally just one part of a sequence, but an essential bit that the viewer absolutely needs to see in order to fully grasp the story being told. It may linger for a split second or much longer, depending on where in the story a certain board falls. Here then contrast through simple tone can do wonders. It can transform a line drawing with a lot going on into a simple composition that everyone knows the focus of instantly. 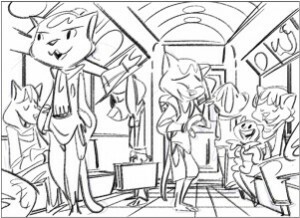 Take a look at this storyboard panel by Michael Lester who works over at Dreamworks. 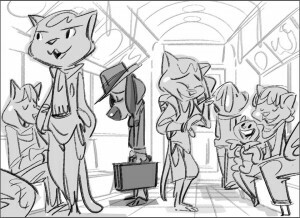 There’s a HUGE amount going on in this subway car, with a large cast of characters, but thanks to tone and contrast your eyes are drawn immediately to the most important aspect (the dog in the hat) and then allowed the freedom to look over all the happy riders around him. The darker tone for the dog also plays nicely into the sad pose he’s taking. Behold, like a magic trick, what happens when we remove the simple tonal contrast! Suddenly you notice a whole lot more lines than the partially filled piece. Where exactly are you supposed to look? Is the focus the large cat to the left? Perhaps the laughing character? Maybe the story is following the child to the right, off on his first subway ride? Eventually you might make note that the dog character has a nice aura of negative space (not touching any other characters) so it may be the story is about him. Without the tone, though, getting to that point takes a lot of thinking and a long time. Time storyboard artists need to keep moving along quickly.